Back when I lived in the suburbs of Milwaukee, I used to frequent a little restaurant called Heinemann's. One of the dishes that the (now defunct) restaurant was known for was its baked oatmeal. At the time it was almost impossible to find the recipe but my sister-in-law worked hard to find a suitable alternative. When she did, she carefully wrote the recipe out for me on a note card. And then I not-so-carefully lost it. Not wanting to admit that to her, I Googled some baked oatmeal recipes and came up with one that I liked. I thought it came from Quaker.com, but it turns out my version is slightly different from Quaker's (so I'm not exactly sure where it came from). In large bowl, combine first five ingredients. Mix well. In a medium bowl, combine last four ingredients. Mix well. Add wet ingredients to the dry ones and mix until blended. Pour into baking dish. Bake 55-60 minutes or until center is set and firm to the touch. In doing my "research" for this post, I discovered a Heinemann's copycat recipe (which may actually be the one my sister-in-law so lovingly wrote out for me...) You can find it here. This looks good! I'm an oatmeal fan, but I've never had baked oatmeal. So do you cut it like bars? Is it cake-like or more brownie-like in consistancy? Could you just pour milk over it? Is it good cold or do you have to serve it hot? Do you wish I would stop asking these questions???!!! Okay, it has a cake-like consistency and you cut it like a cake. I suppose you could pour milk on it but I probably wouldn't. It's delicious hot or cold. We are familiar with Heineman’s in Milwaukee & the baked oatmeal is our favorite!! We always added a little hot milk to it. Thanks for this wonderful recipe. Heard the Heineman’s didn’t want to give out the recipe in case they ever reopened!! This looks like it would be really good hot out of the oven! I have never heard of baked oatmeal before! Thanks for the link! I, like the others, never heard of doing this before ... so now I have something that I should, try since I love oatmeal! Thank you for sharing this with The "Sunday Stop"! Ha! You sound like me. I never know where those recipes go that people write down for me. I have never in all my life heard of baked oatmeal, but now that I see the ingredients and how you do it, I wonder why we never did. It sounds simple, easy and really good. I'm going to try it. Thanks for the idea! MY MOM AND GRANDMOTHER USE TO MAKE EXTRA OATMEAL AND THEY MADE PATTIES WITH IT, FRIED IT IN BUTTER AND SERVED IT WITH MAPLE SYRUP (NY SYRUP ROCKS) AND SAUSAGE AND WE HAD BREAKFAST FOR DINNER!! THEY WERE DELICIOUS. I'M THINKING WE HAVE VERY SIMILAR RECIPES BUT YOUR IS THE HEALTHIER VERSION!! HAVE A HAPPY!! I think this may be tomorrow's breakfast! 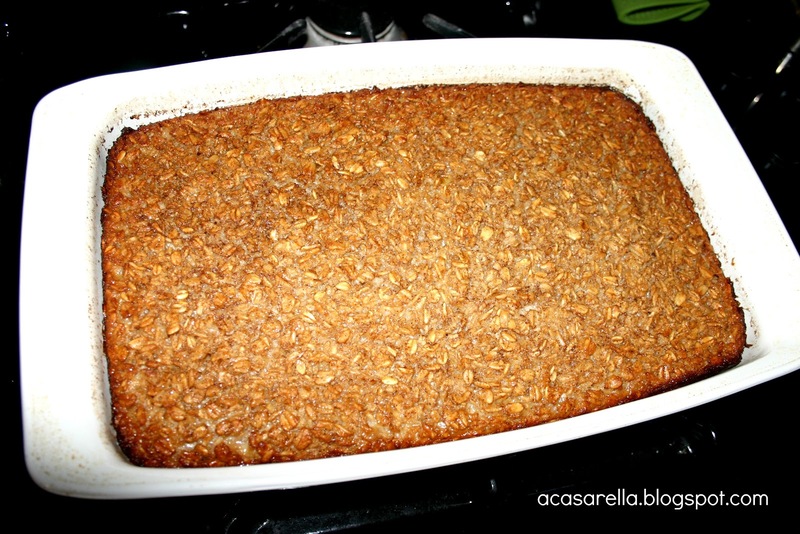 I must make this asap...me and my little girls LOVE oatmeal! mmm-mmm, looks delish! Sharing this on pinterest right now! These sound absolutely delicious! I am going to make them right now! BTW I checked on myfitnesspal.com for the calories per serving (I included 3/4 c raisens vs craisens) and it is only 139 calories for 1/16. That is not bad at all for such a yummy treat! I saw your link on the ivy cottage blog and am so glad I decided to stop by! This looks wonderful. I've never had baked oatmeal. I'm going to have to give this a try. Thanks for sharing at the All Star Block Party. Yum! I'll definitely be making this, but with the addition of cinnamon. I pay a visit every day a few websites and blogs to read articles or reviews, but this weblog offers quality based posts. Preheat oven to 350. In bowl, mix first 5 ingredients. In another bowl, mix next 4 ingredients. Combine the two bowls together and add raisins. Coat 8 or 9 inch bake pan lightly with spray vegetable oil. Spread mixture in pan. Bake in preheated oven 20-30 minutes or until done. Makes 9 servings. You can make it and keep in refrigerator until you use it. Add milk and warm it in microwave for 40-50 seconds. Enjoy!